I have updated switched to a MacBook Pro recently, and I like it very much. But I’m annoyed by my old iPod as I have tons of songs which I want to back them up to the MacBook. I wonder if there is an easy way to do that without losing music on my iPod. I will appreciate all of your suggestions, please help me with this. Thanks! Many iPod users are loyal to the device as it can store amount of songs, and provides high-quality music in iTunes store. iPod has been popular for many years, and the songs may have been stored in the device for years, so when the users updated to a new Mac computer, they will try to find a way to transfer music from iPod to Mac. When it comes to transferring music from iPod to Mac, the first choice may be iTunes. iTunes allows users to sync music from computer to iPod with ease, but it doesn’t transfer the non-purchased music files. When it comes to transferring music from iPod to computer, the software will only transfer the purchased files and erase all the non-purchased songs. So if you want to transfer music from iPod to MacBook, you need to find another way to do it. In fact, you can take advantage of your MacBook to copy iPod music to MacBook, and don’t need iTunes at all. The following tutorial will show you how to do it. Start iTunes, and go to “Edit > Preference > Devices”, and check “Prevent iPods, iPhones and iPads from syncing automatically”. Hold down the option and command (Apple/cloverleaf) keys of iPad, and then plug it into the MacBook via the USB cable. iTunes will warn you that the iPod is running in Safe Mode. Quit iTunes, and your iPod will be accessible in MacBook. The iPod can be seen on your MacBook desktop. If not, go to Finder and enter /volumes. Then the iPod folder will be shown in that folder. Type or copy the following two commands into the Terminal window. Press Return or Enter key after you enter each line. Then you are able to see the ipod_control folder in the iPod folder. Open the folder and you will see all the music files in it. You are able to copy and paste the music files to another folder on your MacBook. With this method, transferring music from iPod to Mac is so easy to do for iPod users. But it is a little complicated, and many users will want an easy way. At this moment, the third-party iPod transfer software will be helpful. The following guidance will introduce two pieces of software to show you how to transfer music from iPod to Mac computer with easiness. 1. Connect your iPod to Mac and launch iSkysoft TunesOver, you will directly see your device information in the main interface. 2. You can directly click the “Export Music to Mac” button at the bottom of the main interface. 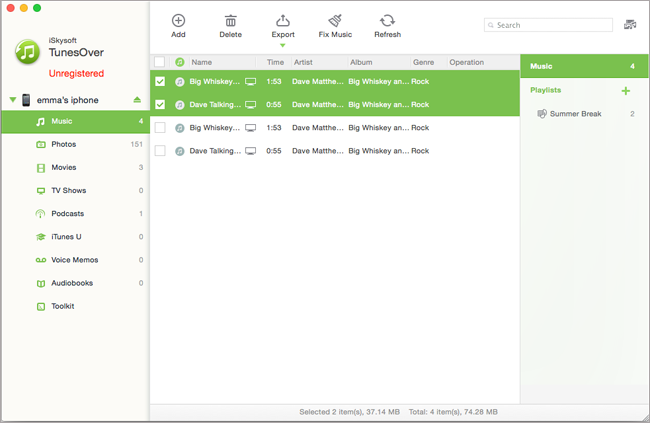 This application will intelligently transfer the missing songs to your Mac. Alternatively, you can click the “Music” menu and select the music you want, and then click the “Export to Mac” button on top of the primary window to start transferring. 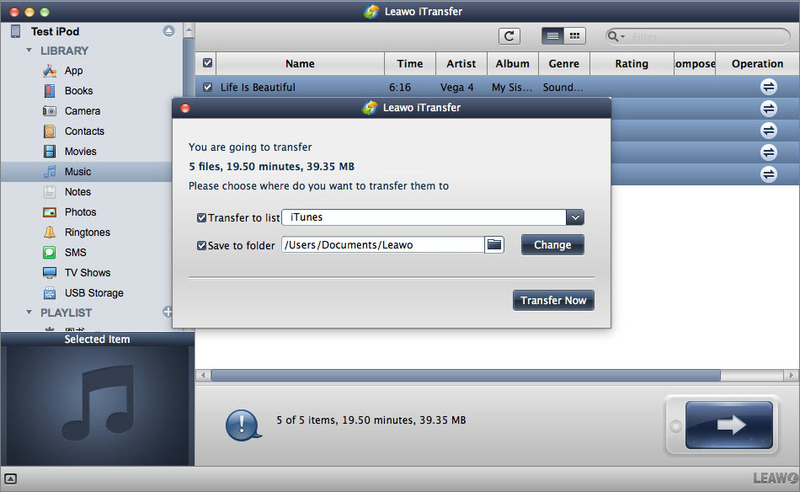 Leawo iTransfer for Mac, a useful iPod transfer program for Mac users, is used for transferring files among iOS devices, iTunes and Mac computers, and it enables users to backup iPhone, iPad and iPod files to computer with ease. The following guidance will show you how to transfer music from iPod to Mac, and you are allowed to free download the software to have a try. Note: Leawo iTransfer only works with iTunes installed on your Mac. 1. Run Leawo iTransfer and connect iPod to computer with USB cable. Then click the name of iPod, and choose Music in the left sidebar. Then the songs in your iPod will show up in the right part. 2. Select the songs you want to transfer and click the transfer button at the right bottom. 3. Check Save to Folder and choose a target folder on your Mac computer to save the songs. Then click Transfer Now. 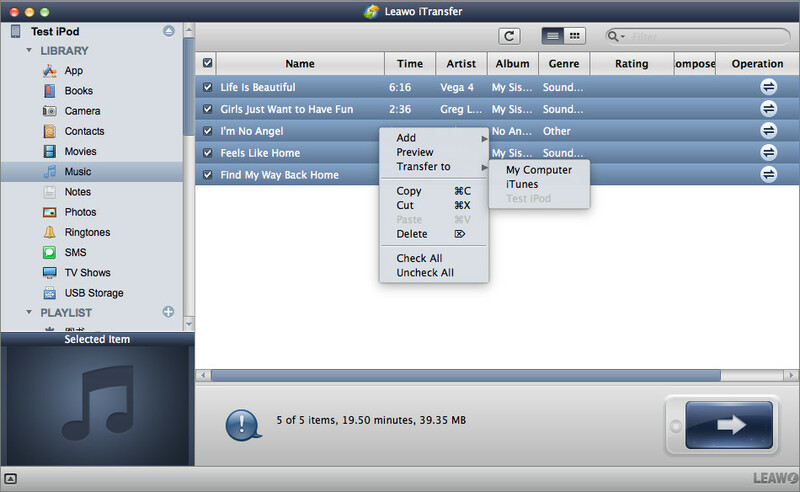 The above two software can help users know how to transfer music from iPod to Mac computers. 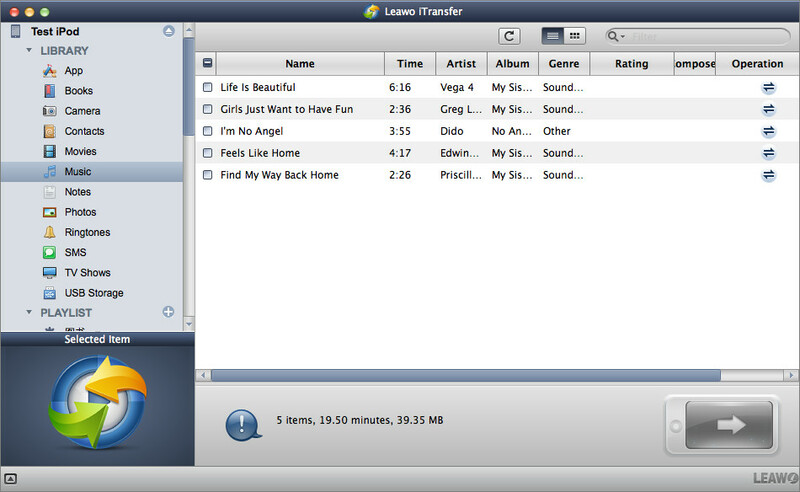 iSkysoft TunesOver and Leawo iTransfer are both all-in-one iPhone/iPad/iPod data transfer tools for Windows/Mac users. There are some similarities and differences between the two software. The following table will show you their comparison, and you can choose any one for your actual need. Maybe here are other methods you could think of to sync iPad with new computer. You can feel free to have a try.